I went through quite a period where I had the worst luck when it came to buying personal horses. This horse was one such case. a beautiful AQHA amber champagne colt. I had the vet check him for a heart defect since I had just had another horse die at 2 years old of a congenital heart valve deformity. The vet said yup, his heart is good. Had the vet check for two testicles, yup, everything good there. Didn’t ask the vet to do anything else. I saw no reason to pay for a vet check on a horse under 2 not broke to saddle. I wasn’t worried about soundness and the only two items I thought I cared about I had the vet check for. When my gorgeous new colt arrived I was super excited. The next day, while I was playing with him I thought I’d school him on showing his teeth as I do all young horses. Wow was I surprised! I guess the saying is true, never look a gift horse in the mouth. My heart sunk. The breeder/seller asserted no knowledge that the foals mouth was deformed. Although I highly doubt that they didn’t know, there was nothing worth doing about it at the time. What is Parrot Mouth in Horses? 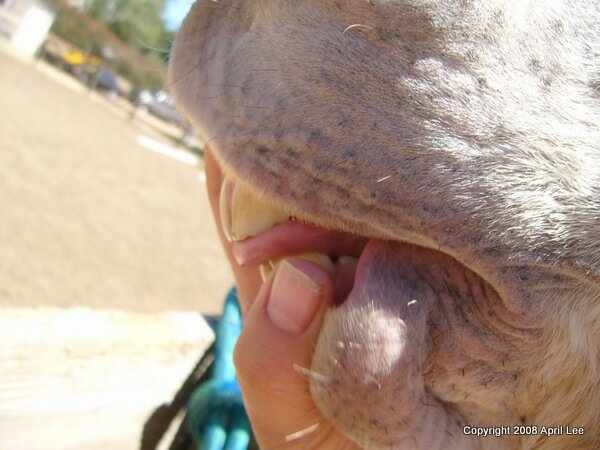 Parrot Mouth in horses is a defect of the mouth that looks basically like an overbite or underbite where the upper and lower teeth don’t touch. The American Association of Equine Practitioners defines parrot mouth as “no occlusal contact between the upper and lower central incisors”. What is Buck Teeth in Horses? Buck teeth is a slang term for parrot mouth. A buck-toothed horse is a horse with an overbite. Typically “buck teeth” are horses that extend over the lower lip. Most parrot mouthed horses won’t have an overbite so severe that it would extend past the lower lip. What is the Difference Between Parrot Mouth and Monkey Mouth in Horses? The horse in the pictures above had an “overbite” which is commonly described as parrot mouth. Conversely, horses with an underbite are usually described as “monkey mouth” or “monkey jaw”. What Causes Parrot Mouth In Horses? By all accounts, parrot mouth in horses is genetic. That means you should not ever breed a horse that exhibits this type of condition. In fact, when showing “halter”, a judge may ask to see a horse’s bite. The AQHA actually requires horse owners to disclose it. They will mark the condition on the horse’s papers but won’t prevent the owner from breeding. What if Your Horse Has Parrot Mouth? 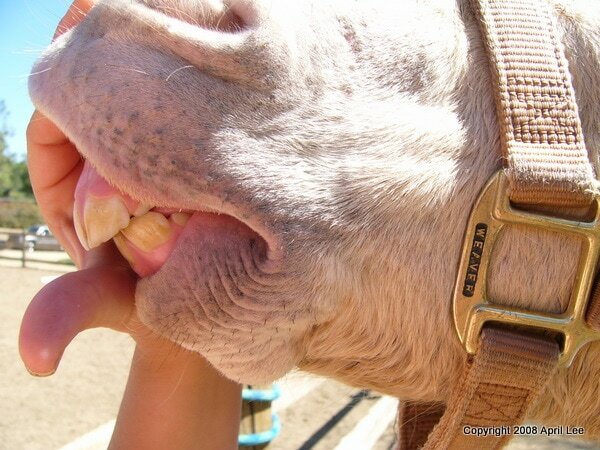 If your horse has parrot mouth, the best thing to do is have him routinely seen by an equine dental specialist. Establish a plan with the equine dentist to have your horse routinely floated. Horses with parrot mouth can live with the condition more easily with proper dental care. Because there is no occlusal contact with the top and bottom teeth, they don’t get worn down like they would in a normal horse. That means the dentist will have to file them routinely so that they don’t cause issues with the gums. In addition to the front teeth needing filing, the back teeth will also not align properly. The equine dentist will be sure to remove hooks and overgrowth in the back teeth at each floating as well. You should talk with your vet and your equine dentist to see if there are any other concerns to keep an eye on with your horse. What If The Horse I Am Considering Buying Has Parrot Mouth? I would not ever knowingly buy a parrot mouth horse, even a gelding. The vet informed me he would need to be seen by a professional at least twice a year due to the uneven wear on the teeth. He would likely have issues under saddle and possible early arthritis in his jaw because of the way the joint sits. He would also likely be uncomfortable wearing a bit. I believe every horse purchaser needs to make that decision for themselves. 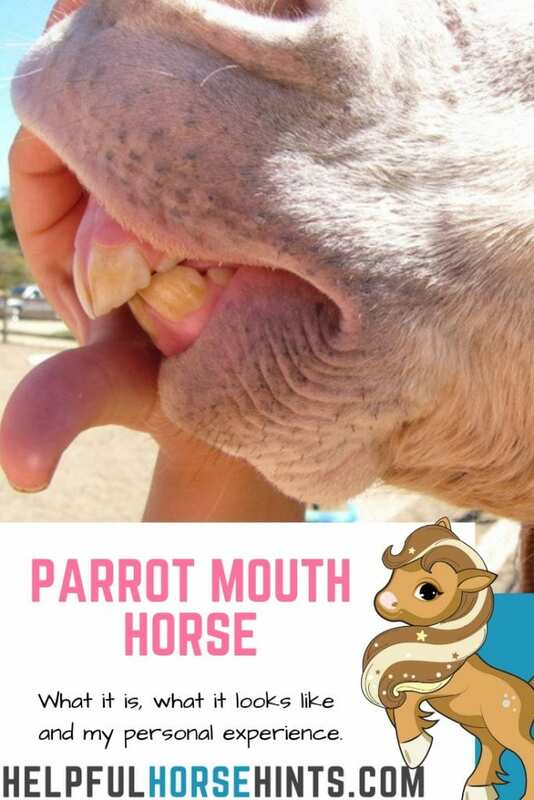 If you are considering purchasing a horse with parrot mouth, I recommend you do your research and have the horse in question looked at by a vet before purchasing. I would never have purchased this horse if I had taken the time to see him in person. If I had gotten a vet check for sure I would have reached a settlement with the vet if the issue was missed. As it played out I only got 20% recovered on my investment when I sold him as a riding horse. For those of you unaware of parrot mouth, here are some pictures. This particular colt had no occlusion on his front incisors. basically, that means none of his top teeth touched his bottom teeth. The pictures don’t show that too well, but that was the case with this boy. I took three pictures because depending on the angle it didn’t look soo bad. 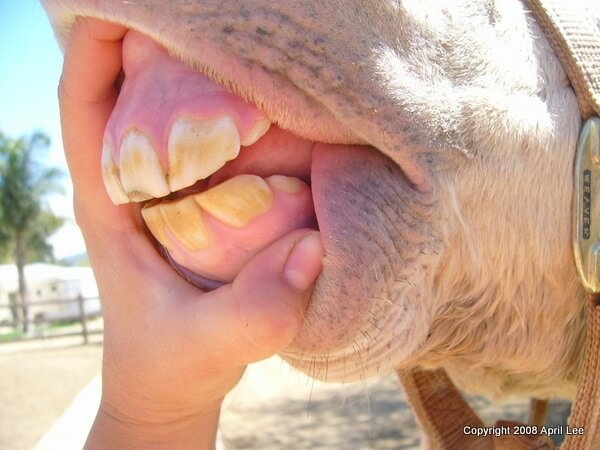 It is important that you always personally check the teeth of the horse you are going to buy. it would have been very easy for a seller to turn this horse’s head, take a picture like the bottom one, and the overbite would seem less severe than it actually is. A Third View making the horse’s mouth look almost normal. 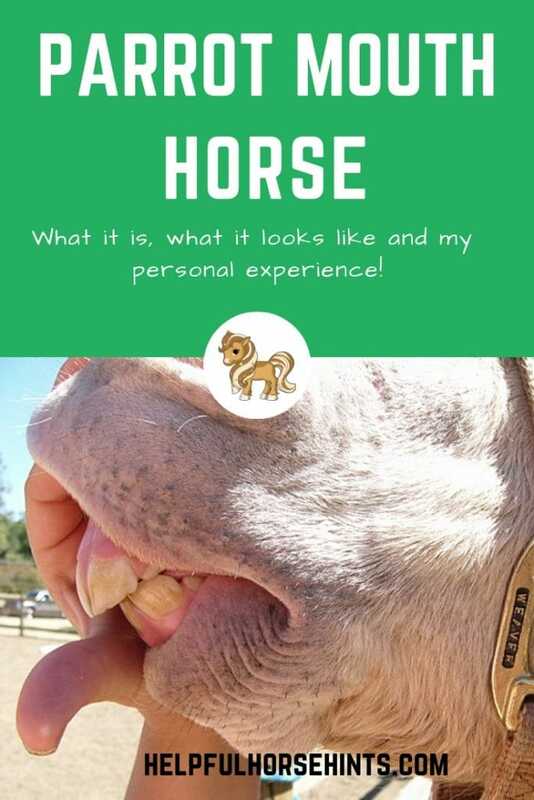 Do you have a horse with parrot mouth or monkey mouth? Would you like to contribute your pictures / experience to help other horse owners? Leave a comment below. We’d love to hear your experience with Parrot Mouth!